A new 3.4-liter Mercury V-6 platform rated at 175/200/225 horsepower is light-weight, compact and loaded with technology. 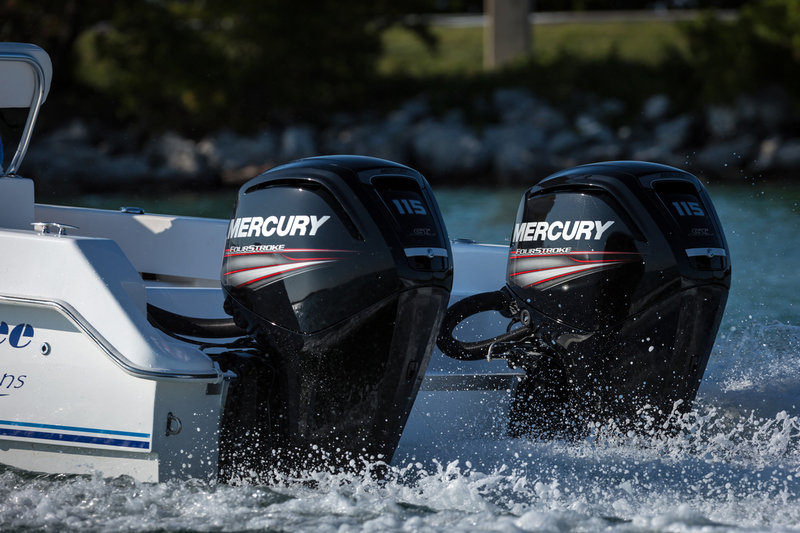 Mercury Marine has released details on an all-new V-6 outboard platform. 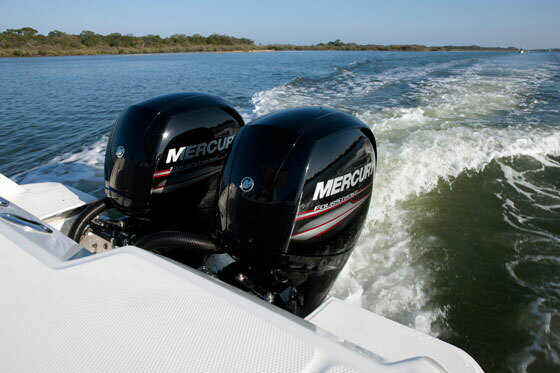 The 3.4-liter FourStroke outboards will be rated at 175, 200 and 225 HP, and will for the time being be offered alongside the current Mercury Verado model outboards at the same horsepower rating. The new motors represent a huge design departure from the Verado platform, which relies on a supercharger to boost small-displacement powerheads; a 1.7-liter four-cylinder for the 175/200 and a 2.6-liter in-line six for the 225. The new V-6 follows the “robust displacement” philosophy established first by the introduction of the FourStroke 150 in 2011, the idea being that the 3.0-liter four-cylinder 150 would be under-stressed and thus more durable. The FourStroke 150 also had a number of features designed to make it easy to maintain, and to use for re-power applications. 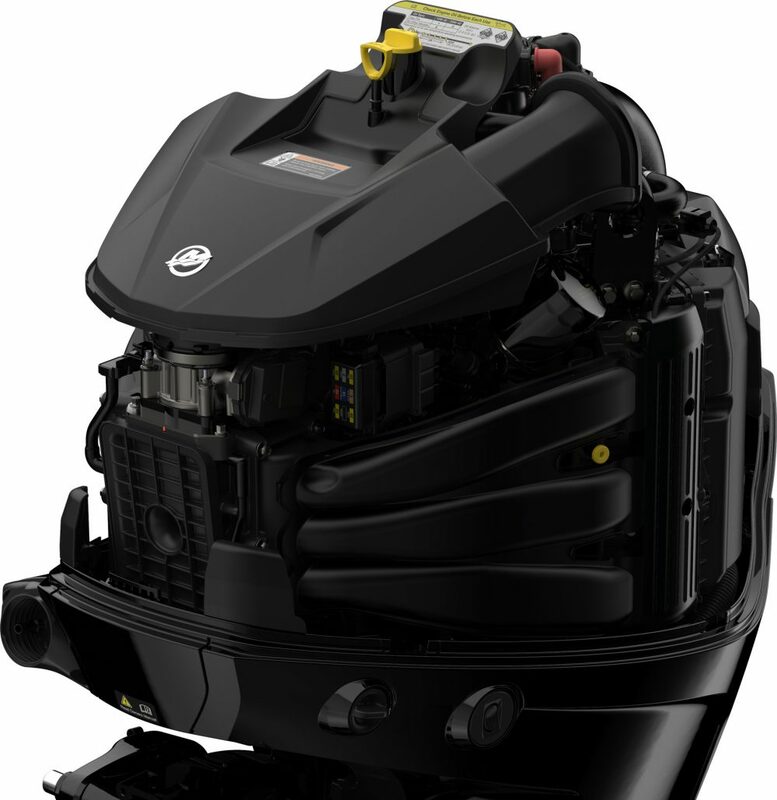 A new cowl shape is a clue that this is the all-new Mercury 3.4-liter V-6 FourStroke outboard. All of that applies to the new V-6. The powerhead has a 64-degree cylinder bank and double-overhead cams with four valves per cylinder. The cams are chain-driven, so there’s no belt to check or adjust. All models use the familiar Mercury 4.8-inch diameter gearcase with a 1.85:1 gear ratio. Mercury says the engine is naturally balanced and does not require a balance shaft to quell vibration. 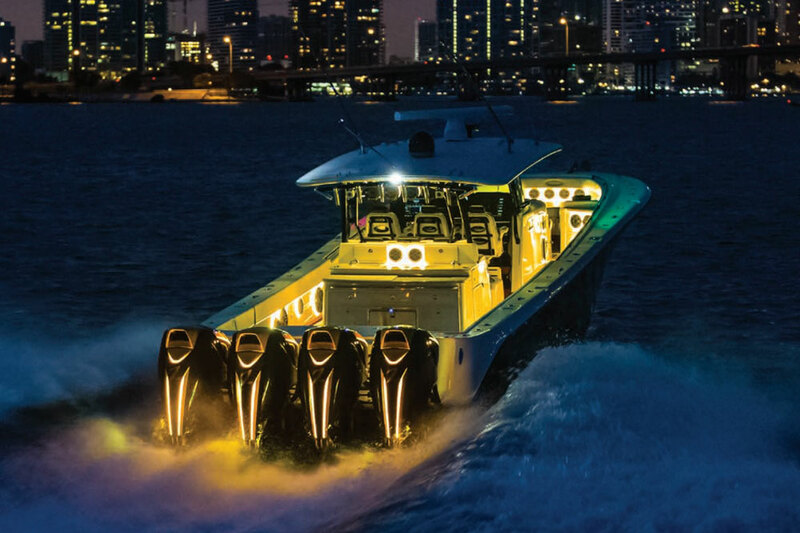 To reduce engine noise the new platform features a multi-chamber air intake to quiet induction noise, fuel injector covers reduce high-frequency noise, and cowl features that prevent noise from reaching the operator. 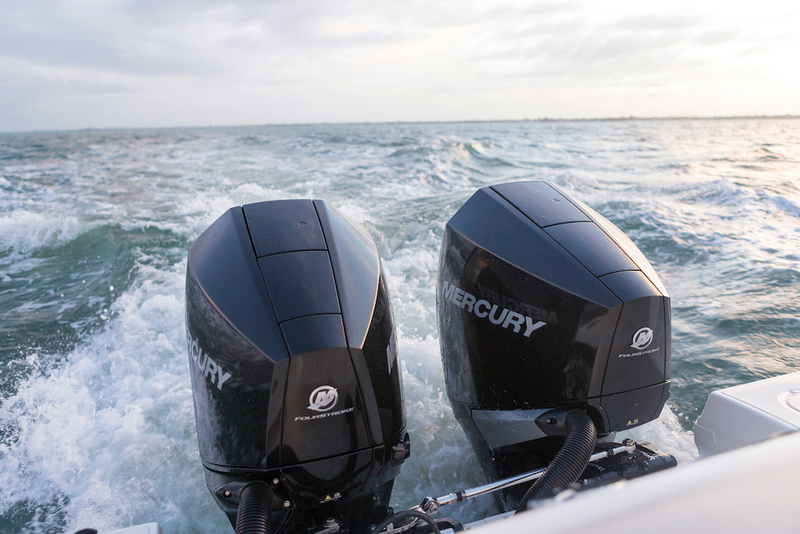 The cowl and midsection blend together to form one dramatic shape on the new Mercury FourStroke outboards. Gearcase is the familiar 4.88-inch diameter model. 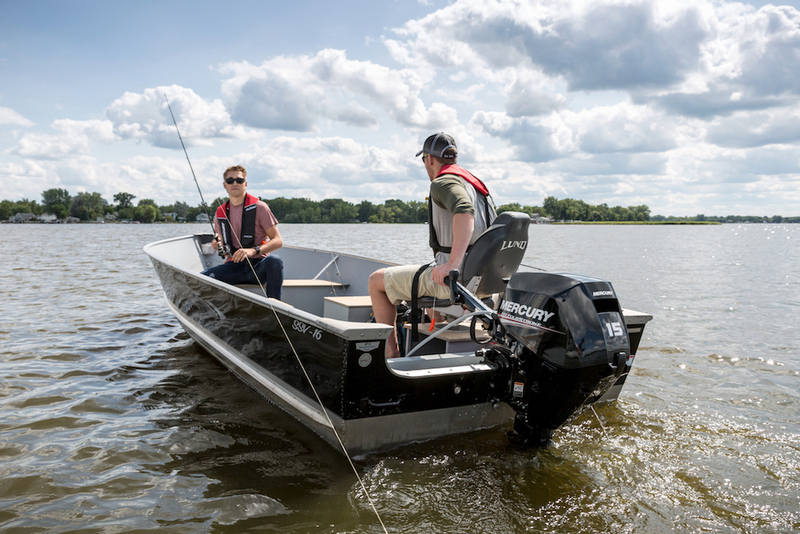 At the 200 HP rating, the new Mercury 3.4-liter V-6 offers the most displacement; Yamaha and Suzuki 200 models are 2.8 liters, and the Evinrude 200 is 2.7 liters. 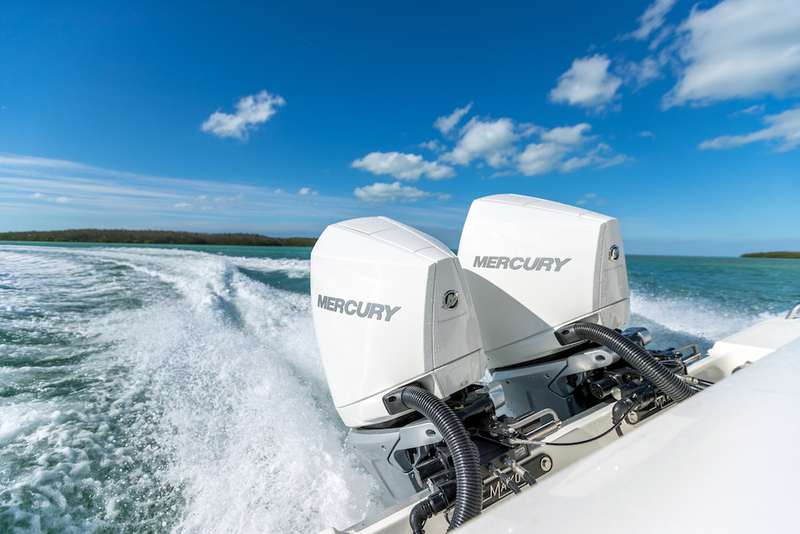 With a 20-inch shaft length, the new Mercury V-6 has a dry weight of 475 pounds. That’s 35 pounds lighter than a four-cylinder Verado. A 2.8-liter Yamaha F200 weighs 487 pounds, and 4.2-liter V-6 Yamaha F225 weighs 551 pounds. Because they mount on narrow 26-inch centers, the new Mercury V-6 FourStrokes will fit on tight transoms, a bonus for re-power applications. 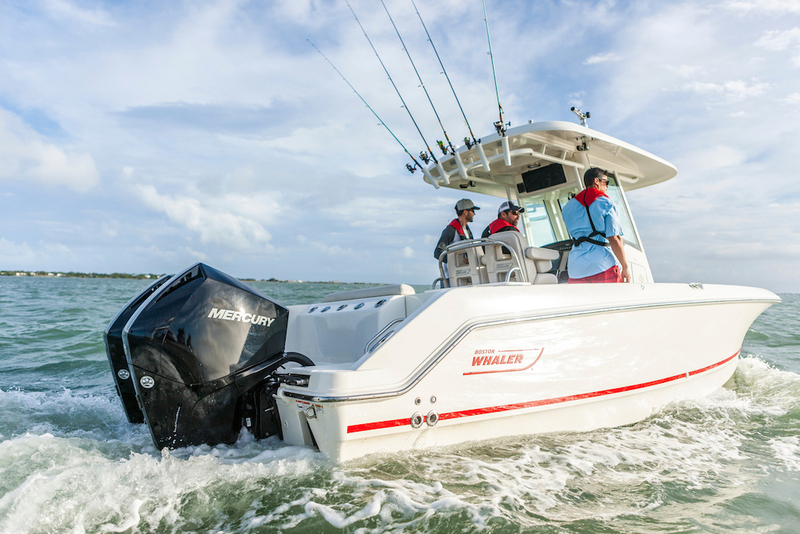 The new V-6 FourStroke models offer a lot of rigging versatility. 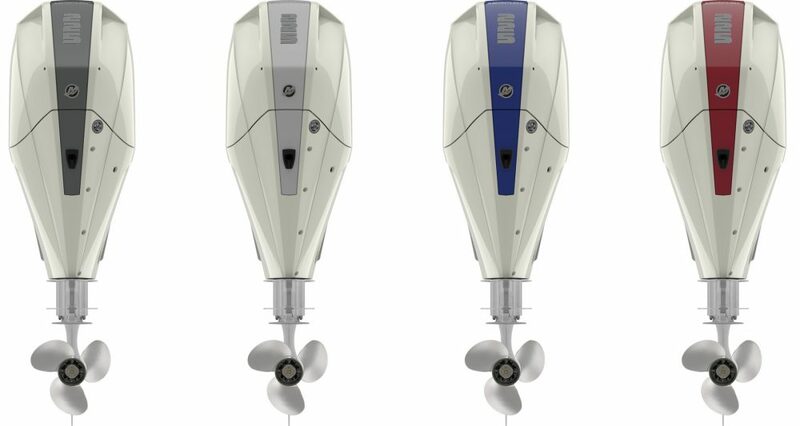 They fit on 26-inch centers for multi-motor rigs—nice for re-powering older boats—and can be rigged with either mechanical or Digital Throttle and Shift (DTS) controls, and with either hydraulic or electro-hydraulic power steering (a system similar to that used on Verado models), but they are not offered with Mercury Joystick Control for Outboards. The new motors do have other Mercury technology built in, however. Adaptive Speed Control (ASC) maintains engine speed (rpm) regardless of load or condition changes—such as tight turns or tow sports—without having to frequently adjust throttle position. Idle Charge battery-management is designed to prevent draining batteries while operating multiple electronic devices. 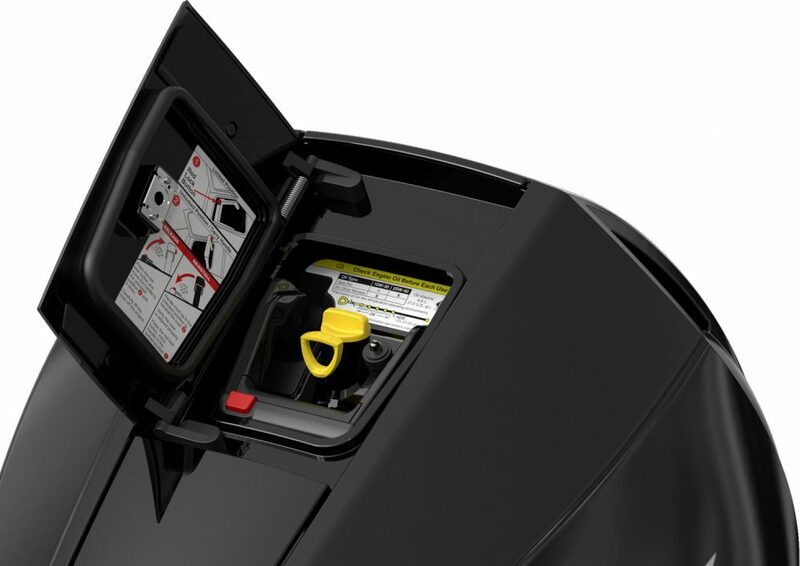 When battery voltage is reduced, the engine will automatically increase idle rpm to boost alternator output and recharge low batteries to the proper level. The 85 amp alternator makes 20 amps of charging power at idle speed. To improve fuel economy, the new V-6 models feature Advanced Range Optimization (ARO) and closed-loop fuel control, which work together to precisely adjust the fuel mixture and deliver the best-possible efficiency, on 87 octane fuel. Details such as bearing sizes and oil-flow scheme have been engineered to reduce internal friction and improve overall efficiency. Here’s a brilliant idea. Service door in the top of the cowl offers easy access to the dipstick for oil level checks, the latch to release the cowl, and to a cowl carry handle. The new 3.4-liter powerhead is tightly packaged and nicely finished. A single central throttle body feed torque-boosting, long intake runners to each cylinder bank. Ease of maintenance is addressed in a number of ways, my personal favorite being the new “top cowl service door,” a water-tight hatch in the top of the cowl that allows oil checks without removing the entire cowl. All I can say is finally! 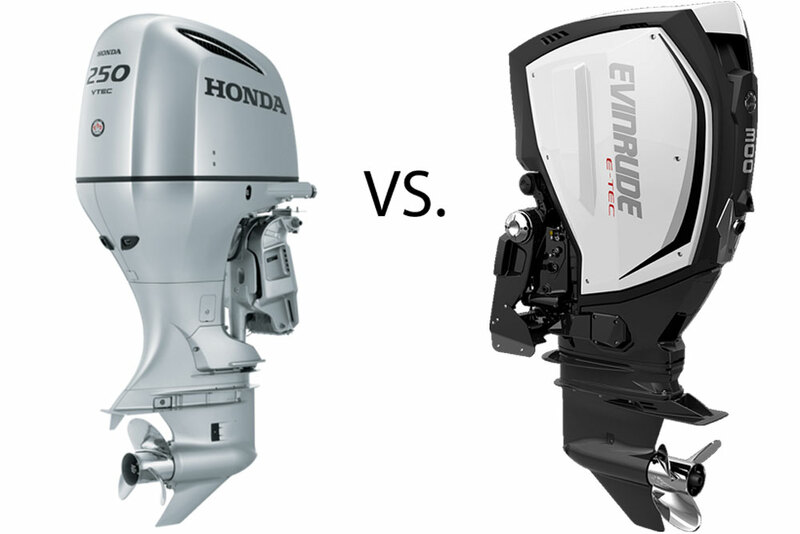 Think of all the four-stroke outboards that never get an oil check simply because it’s such a hassle to remove the cowl. Problem solved, and no more excuses. The oil fill is also located below this service door, as is the latch release for removing the cowl, and a carry handle to make it easier to tote the cowl around. A graphic, hour-based maintenance decal located under the cowl provides a quick overview of routine maintenance intervals as well as a QR code to access additional information. Accent panels in four colors will be sold as an accessory kit or to boat builders to customize the looks of the new motors. In addition to the traditional Mercury Phantom Black color, the new V-6 FourStroke 225 and 200 models will be offered (at extra charge) in the three shades of white currently offered for Verado motors: Warm Fusion, Cold Fusion and Pearl Fusion. The 175 FourStroke only comes in black. Color variation can be further customized with factory-painted, polycarbonate accent panels that will be available as kits (purchased separately) in gray, silver, blue and red. The new motors are in production and shipping to dealers and boat builders. No word yet on pricing.